﻿ Safety - Total Oilfield Rentals Ltd.
Total Oilfield Rentals Ltd. is committed to the safety of its employees, all people with whom business is conducted, and the traveling public we share the road with. In order to achieve this standard, both management and the employees strive to meet, or exceed, all legislative and operational requirements. Total Oilfield Rentals Ltd. operates its trucking fleet under a safety program and maintains a valid Certificate of Recognition in partnership with the Alberta Motor Transport Association. 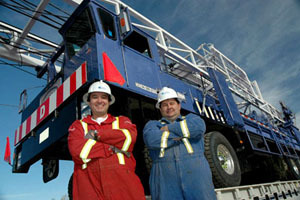 Federal, Provincial and State Legislation as well as national safety standards are adhered to by such criteria as maintaining driver daily logs, training of employees in H2S Alive, WHMIS, TDG, First Aid, Confined Space Entry, and other pertinent areas that are required to perform our services safely. Drivers are also trained to conduct pre/post trip inspections that meet the criteria set out by the North American Commercial Vehicle Safety Alliance. Total Oilfield Rentals Ltd. maintains a modern and updated line of rental equipment that meets or exceeds requirements. Our units are either purchased or built to pertinent specifications, and are brought up to current specifications as required to provide safe standards and operations. All maintenance personnel are trained and equipped with items such as fall protection equipment, breathing apparatus and testing devices that are operated to both legislative and industry standards. All equipment is cleaned prior to leaving our locations and is done with minimal environmental impact. Our goal is to operate safely and efficiently while having minimal impact on the environment. By maintaining a modern and up to date fleet of trucking and rental equipment and having a trained and knowledgeable staff Total Oilfield Rentals Ltd. is able to achieve this goal. Please click here to learn more about our safety programs.